How to collect shipping charges upfront? Learn how you can collect the shipping charges when you are charging the customer upfront for a subscription. On most occasions, you might want to collect the shipping charges upfront as well. Let's say, you have a subscription product. You are collecting the upfront payment for every three billing cycles. You may also want to collect the shipping charges for all three cycles as well. So that you can initiate the fulfillment every month and have your shipping cost collected upfront from the customer. 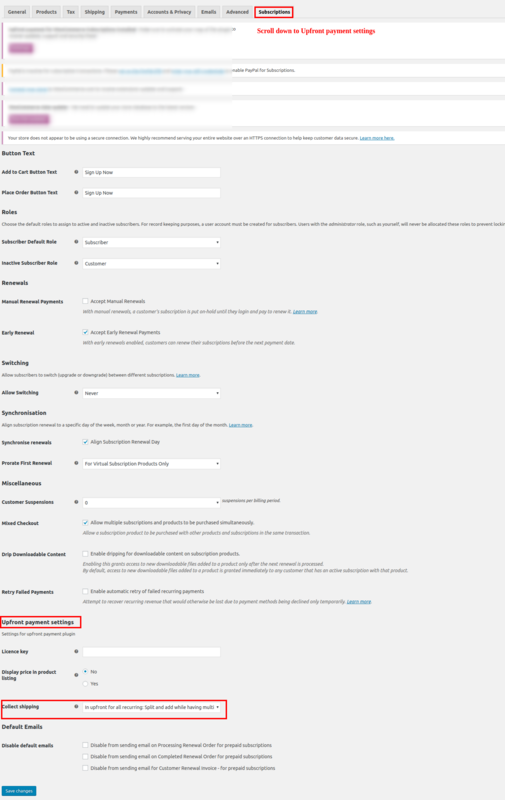 To get started, navigate to Woocommerce --> Settings -> Subscriptions tab. Scroll to the bottom to find: Upfront payment settings. Shipping cost will be collected only for the first month. When two products are added to the cart, the shipping cost for each of the product will be split and calculated accordingly.